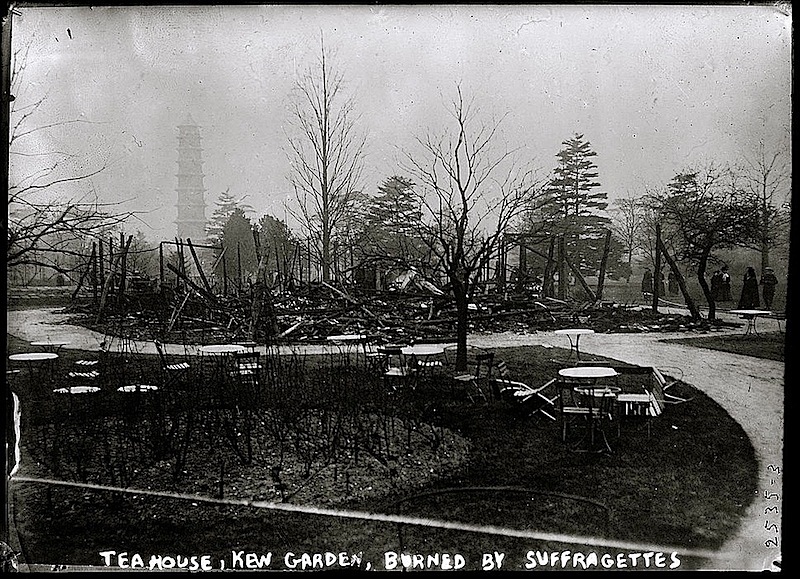 “Tea House, Kew Gardens,* burned by suffragettes,” February 1913, by Bain News Service, via Library of Congress Prints and Photographs Division. Twelve days earlier, Kew’s orchid house had been attacked, although much less seriously: a window was broken and some specimens were destroyed. There was £900 of damage to the tea house building. Unfortunately, the owners — two women — had only insured it for £500. Olive Wharry and Lilian Lenton, of the militant Women’s Social and Political Union (WSPU), were arrested on the night of the attack and later sentenced to 18 months each in Holloway prison. Both were released early after going on hunger strikes. WSPU members also used acid to burn the words “votes for women” into the greens of golf courses. *Located 10 miles west of central London, U.K.
Interesting–I didn’t know this history. I never knew that the British suffragettes made such radical attacks. Then they gave them up quite suddenly, out of patriotism, when WWI began.